Have I got a Website for you !!! 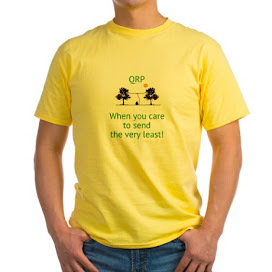 But if you're like me, then you remember your days as Novice Amateur Radio operator warmly. And, if you're like me, you enjoy reading about other folk's Novice radio days. Due to a private e-mail from Cliff Cheng WW6CC, I am happily able to point you to the Novice Historical Society, by clicking here. Cliff has dedicated this Website to the no longer issued Novice license. The Website is complete with various Ham's reminiscences about how they became licensed and what they discovered once they had their tickets. There's even a link to sending in your own Novice story, which I did - tonight! So if you get a bit nostalgic from time to time about the "Good Ol' Days", then do yourself a good turn and visit Cliff's site. It's almost as good as perusing through your old logbooks! You WILL be glad you did. And do the rest of us a good turn and submit YOUR story. There are a bunch of us out here who are dying to read it. 40 Meters was golden tonight! Tonight was one of those rare nights when everything seemed to be going right. 40 Meters was golden. The local neighborhood QRN was nil, there were no major all-band encompassing contests, and signal strengths were decent. In all, I had about 5 QSOs in rather rapid succession. A few were brief; but they were all satisfying. The night started out with a QSO with John K1ESE. John used to be the Contest Manager for the Adventure Radio Society. We've had a lot of Sprint exchanges and a few ragchews. Tonights was mostly about local weather. It's been hot in NJ lately, it's been cool and rainy in Maine with the temps finally reaching the 70s up there. It was 88 Degrees here in Central NJ today! From the QSO with John, I went down and tuned the Extra portion of the band and heard I2JWA calling CQ. My answer got an immediate response and Antonio said that my 5 Watt QRP signal was 599. Now, for those of you ball and chained to QRO, you might be aghast at anything less than 599. Let me state here now and forever for the record - a 559 signal is NOTHING to sneeze at. It is quite copyable with no trouble at all. As always, we promised to exchange cards via the Bureau. From there I had a conversation with Sean W8OKN in Michigan. He was using an Icom IC-746 Pro to a ladder line fed dipole at 25 feet. He had a nice signal and I enjoyed our chat. From there I worked Jean VE2GHI who was just north of Quebec on his annual fishing vacation. Looking in Log- EQF, I see I snagged him around the same time of year two years ago, while he was out (you guessed it!) fishing. He was using a Yaesu FT-817; but didn't mention what he was using for an antenna. This morning was the local W2QW Hamfest which is held each year on the weekend before Field Day. I wasn't able to make it as I had to take my son to a swim meet. He did exceptionally well in his two events; and even though I did want to make that Hamfest badly, I'm glad that I was with my son, instead. He placed 1st in his two events and I'm glad that his "old man" was there to see him. When it comes right down to it, I can get to other Hamfests (and will); but these precious "growing up" moments only come around once in a lifetime. Someday, when I'm gone, I want my son to have memories of me being with him and being proud of him. No matter how badly TV portrays fathers as bumbling fools and idiots; a good Dad makes all the difference in the world in his children's lives. God gave me an important job to do by lending me two children to bring up the right way. I'm gonna do my best to get the job done right. And I truly believe that if I do do the job the right way, the ripples will be felt down the line for generations to come. I was able to make it out to the park for some lunchtime QSOs for the first time in almost two weeks. I was disappointed to tune across the 20 Meter band; only to hear not much. It seemed that calling CQ was in order; so I plunked myself on 14.038 MHz and let the K1's memory keyer do its stuff. A short while later, I was rewarded by a call from Will K9FO. Will and I have worked before in NAQCC Sprints; and he shows up in my logbook a lot. This was the first time I've heard him during my lunchtime QRP efforts. It turned out that Will and a bunch of Ham Radio friends were in a local park enjoying a picnic get together. He was using a KX1 to a 20 Meter vertical loop at 4 Watts out. His signal was anywhere from 559 to 579 depending on the QSB. I'm not sure if either of these pages details exactly what they were using; but I'm sure it's probably pretty close. By the way, I found out that you can literally spend hours looking at all the antenna pages on dxzone.com. There are so many plans and so many ideas there - truly a wealth of information. Awwww .... what do those Hams know, anyway? Finally, an article about what we've been saying for months now.... the new Sunspot cycle is taking its good ol' sweet time getting here! Also, as embarrassed as I am to admit this, my ATS3, which I just finished building .... ain't working. Boo, hiss! The DDS works fine as I get the friendly Morse Code announcement on power up that all is well with the little rig's brain. However, the receiver isn't working. The SA612 chips have all the right voltages on them; but when I measure the voltages on the AGC chips, the V+ supply of 5V drops down to 2.7V. Something is seriously bringing down the supply voltage. I've gone over the soldering with a fine toothed comb looking for solder bridges, and I've double checked component placement. All seems OK in those regards. I'm leaning right now towards the theory that I have a malfunctioning component somewhere that's causing the voltage drop. I hate like heck to start removing SMT devices looking for a bad component; but I may have to resort to that soon. All I can say is ...... NUTS! 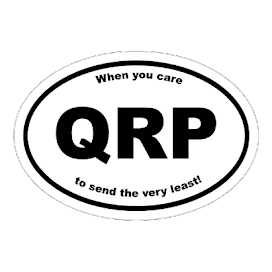 I am a QRP fanatic. I love operating with low power, by my own choice. 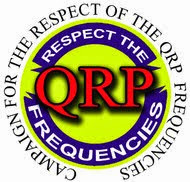 From my Website and hundreds of other posts on this blog; I think you'll agree that QRP is my passion in Amateur Radio and hopefully, I'm one of its biggest proponents. That is not to say that I am not a realist, however. A case in point was my experience from last evening. I was tooling around the 20 Meter band; and I heard TCØW calling CQ. A quick visit to DX Atlas on my computer revealed that I was hearing Turkey quite well. I have never worked Turkey before; and I was starting to salivate! To boot, TCØW was not getting may takers, either - there was no pile up to speak of. I called and I called and I called. No dice. I tried switching back and forth between the G5RV and the Butternut, I tried varying my transmit frequency just a hair to give a different tone. I tried varying my sending speed. I tried just about every trick in my book that has brought me success in the past. I even dialed the K2's power up as high as it would go. Since I don't have Turkey in the log, I was even willing to forgo getting him via QRP. The last remaining trick up my sleeve was to wait a bit as DX Atlas revealed that grayline propagation might make a QSO possible. As dawn was approaching Turkey, dusk was approaching New Jersey. Frustratingly, TCØW's signal was getting weaker not stronger. As Kenny Rogers sang, "You got to know when to hold 'em ... know when to fold 'em". Last night was the time to fold 'em .... or maybe to have a 100 Watt radio on the side - that fifth ace up the sleeve! 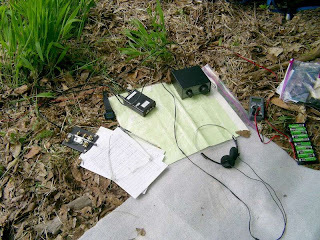 As promised, I said I would share when I heard from Neal W3CUV about his QRP trip to the Allegheny National Forest. Here's the e-mail and a few of the pictures he sent me. I'm not a camping out kind of guy; but this definitely looks like fun! Thanks for getting on the air and listening for me on your busy Saturday afternoon. Working you and another ham (WB4WZR) who I alerted beforehand, made my trip a complete success. I made a total of 12 contacts operating now and then over a 4 day period. 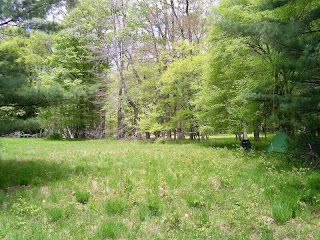 I was camped at a beautiful spot deep in the forest which had been the site of an old farm many years ago. I had camped there dozens of times in the past and knew it would make a good place to put up an antenna and operate. It required a hike of about 5 miles to reach, which threw off my intended operating schedule. Most of my operating was on Friday and Saturday, instead of Saturday and Sunday. My SW40 performed very well, that little rig receives my highest praise. I sent Dave K1SWL an email and told him so. It is a real power miser, and the 10 NiMH AA cells I took were still going strong at the end of the trip. The EFHW antenna which I tried for the first time, also worked well, "as good as a dipole", and easier to put up. My pack, including all my camping gear, food & water, tent, sleeping bag, and radio stuff only weighed 29 pounds. 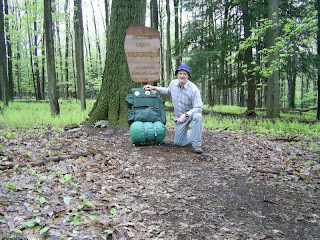 The ANF is about 75 road miles from my home here in Erie, PA My 3 recent QRP backpack trips are the fulfillment of an idea I've had for many years, and are a highlight of my ham career. Like you say, it's hamming at its best. Neal, thanks for the kind words; but I can't imagine how working W2LJ made your trip successful. The fact that you were doing what you like to do ... being outdoors and making QSOs and having fun in the process sounds like a big success to me! Your camping spot looks idyllic; and it ALMOST makes me want to take a crack at doing something like that. Somehow, I think I'm more of an afternoon or day trip hike kind of guy. But whether it's an afternoon outing; or a full blown camping trip, there is nothing like Ham Radio in the big outdoors. Today, marks the anniversary of Operation Overlord; better known as "D-Day". On June 6th, 1944, 850,000 soldiers from the United States, Canada, the United Kingdom, Free France, Poland and other Allied Nations crossed the English Channel to begin landing an invasion force to win back Western Europe from the clutches of Nazi Germany. It was the largest invasion force ever assembled up until that time. The Commander in Chief, Allied Forces, General Dwight D Eisenhower had deep reservations regarding its success. More American soldiers lost their lives on that single day than in the 4 or 5 years of today's Operation Iraqi Freedom. Back in those days, "The Greatest Generation" as they've become to be known, recognized the threat of their day; and rolled up their sleeves to work and defeat it. No one from the media ran around demoralizing the troops and no one from that Congressional era ran around declaring defeat before the operation even began! People back then seemed to have a knack for pulling together and working together to get the job done without the political backbiting that is so prevalent today. So if you have a mother, father, aunt, uncle or grandparent who was part of "The Greatest Generation"; please take the time to thank them for their service, their courage and fortitude. If, in your family, they've all gone on to their reward, then take a moment to remember them, say a prayer for them and give them your thanks that way. I lived out a good commercial for Amateur Radio tonight! I turned on the rig; and there was an exceptional amount of bad QRN on 40 Meters. There has been bad weather rolling through the East Coast; so I guess it's no surprise that the bands were nasty. Rather than listen to static crashes, I decided to work some more on the ATS3. I finished mounting all the SMT devices the other night; and tonight I got all the "through hole" devices mounted. All that is left is the filter boards and the testing and alignment. 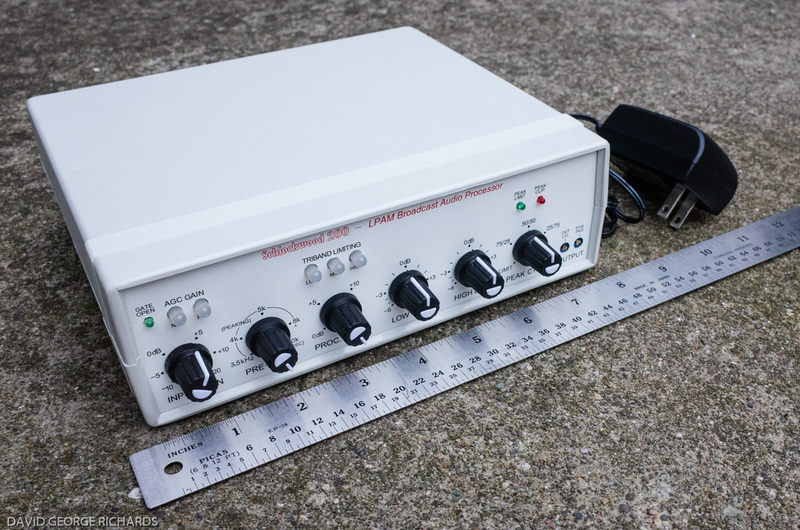 As I began mounting some of "through hole" devices that were in a cramped area of the circuit board, I decided to change the tip on my soldering station. I had to turn it off and let it cool down for a bit; so I flipped the rig back on and started calling CQ on 40 Meters in the neighborhood of the SKCC watering hole of 7.050 MHz. I was answered by Mike AE4R of Vienna, Virginia. Mike had a nice signal into NJ (QRN notwithstanding) and we started gabbing a bit. This is where it gets good! Mike is sitting in his shack, using a Kenwood TS-50 on battery power. It seems there's been a bad spate of thunderstorms and even some tornadoes in the Vienna area; and the entire town is without commercial power! But that made no difference to Mike, who simply connected his rig to a deep cycle battery; and was able to conduct communications as if nothing was out of the ordinary. Granted, this was a ragchew and was not emergency communications; BUT if it had been, Mike and I would have been able to pass whatever traffic was deemed necessary without so much as a hiccup. The fluff ball to the left is my cat, Sadie. Marianne and I "adopted" her right after we got back from our honeymoon, ten years ago. So in essence, she was the first addition to our family. I am NOT a cat person. I am a dog person. I love dogs. We have one - Jesse who is a Brittany. But my wife grew up with cats and I wanted her to have one in the house. When we went to PetsMart to look for a cat we spotted Sadie and her beautiful green eyes. When the sales person took Sadie out of her cage so we could hold her, Sadie took one look at me and literally jumped into my arms. Sadie acts like a dog. For the most part (99% of the time), she will come when you call her. 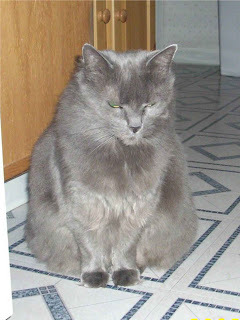 She is very affectionate; and is not the least bit aloof like other cats. She likes to play; and she usually sleeps with us in our bed somewhere near my side. When she wants to be petted, she'll let you know by reaching out for you with her paw. She loves to be scratched behind her ears and underneath her chin. She doesn't even mind when you stroke her tail, which is big and bushy like a squirrel's. Tonight, as I tucked the kids into bed, I came to realize that I hadn't seen Sadie since I got home from work. I checked everywhere - her usual haunts and hideouts. I checked under the sinks, under furniture and in closets. I looked for her in the basement and out in the yard under bushes in the event she somehow got out of the house. She was nowhere to be found. Dejected, I resigned myself to the fact that she probably escaped from the house at some point when the kids had the door open, running inside and out. Sadie is an indoor cat; and was probably gone for good. I couldn't go roaming around the neighborhood looking for her as Marianne is working and I can't leave the kids alone in the house. The Spartan Sprint beckoned; but I wasn't much in the mood. I made about 8 contacts in all when I started hearing noise outside. It seems that the next town over must be hosting a carnival or something; because at 9:30 a fireworks display started. A few explosions was all it took for Sadie to come out of her hiding place and come running for my lap. One second she was nowhere to be found, the next she was a gray blur heading right for me. She had been in the house the whole time! I have no idea where she was hiding or why. She must have fallen asleep and didn't hear me as she almost always comes when I call. I'm just happy and relieved that she didn't run away. There will be other Spartan Sprints; but there's only one Sadie!